Since its inception almost half a century ago, Planet has consistently pushed our boundaries of discourse. It has challenged, provoked and inspired, and always remained true to its own subhead (‘The Welsh Internationalist’) by placing our small country in far wider contexts. In a world where so many are hell-bent on building barriers and narrowing horizons, we need it now more than ever. I believe Planet magazine to be an essential contributor to the development of Wales as a cultivated modern European country. I know of no other magazine which collates Welsh ideas and values so thoughtfully with intellectual developments in the world at large, and interprets the results in such excellent journalism. Planet magazine is a choir of well-conceived essays, unafraid to ask uncomfortable questions, and brave enough to put forward progressive solutions as part of the complex discourse that comprises Wales’s political and cultural identity. In these fraught times, visionary writing and dialogue are needed to map ways forward that give flight to innovative European ideas whilst being strongly rooted in Wales’ great traditions and literature. Without Planet, our world would be not only smaller and more inward-looking but also impoverished in creativity and intellectual expression. Planet is a first-rate magazine and as someone who travels a great deal I have yet to find a magazine like it. It is simply unique. It is a magazine of significance and value which should receive the necessary support to continue which its excellent work. Planet links us to the wider world yet understands the distinctiveness of place, nation and language. To my mind Planet is the best small magazine in Wales, intelligent but always fresh and innovative. Its political coverage is ground-breaking, supplied by a truly diverse range of voices, while its arts and culture analysis is constantly varied and astute. Planet has been for many years an important forum for informed discussion of the relationship between Wales and the world. It is also an open forum, not restricted to professional academics or to career politicians. It is important for these reasons that Planet’s contribution to the cultural and intellectual life of our nation be sustained and enhanced in the years to come. Planet has been the sole constant in my 35-year love affair with Wales. My subscription to Planet, which goes back to 1985 or so, has been my lifeline to my chosen country. It allows me to keep up with political debates; it’s introduced me to scores of new writers, scholars, and artists; allowed me to burrow into topics as diverse as LGBT rights and aerial archaeology. Simply put, without Planet I wouldn’t be as gleefully Welsh as I’ve become. Perhaps due to the ambitious context of its subtitle—‘The Welsh Internationalist’—Planet has held itself to an exceedingly high standard and never wavered. It is a beacon to readers at home and abroad, and is utterly unique. Please keep it alive! Wales faces a well-documented information deficit, whereby a significant percentage of the Welsh population does not receive any news or commentary about any issue in Wales. This has been all the more crippling given the current political situation, where right-wing populism is on the rise and has gained a foothold in the Senedd. Within this milieu, Planet stands alone as a beacon of hope. Not only is it the only English-language politics and cultural publication in Wales, it just so happens to be genuinely excellent. It provides incisive and innovative political and social commentary from across the political spectrum, much needed analysis of the arts and culture in Wales, as well as short stories and poetry. It is, in short, an outstanding publication that is absolutely vital to the public sphere in Wales. Since I moved to Wales in the early 1990s I have found Planet to be an absolutely invaluable resource for anyone that looks for a broad, generous, intellectual understanding of what it means to live in this country. In a country that sadly lacks a vibrant contemporary newspaper scene for a whole variety of reasons the survival of an excellent print and online journal such as Planet should be seen as vital to the idea that Wales is a thriving independent culture. Planet supplies a vital space for in-depth coverage and discussion of culture and politics, managing to balance its focus on Wales with a commitment to representing Wales in the wider world. As a writer, Planet has given me valuable opportunities to develop, as well as providing informative, entertaining and engaging material for me as a reader. I see Planet as an innovator though still working within the classic tradition of Welsh Periodicals in English: a true miscellany mingling intelligent political, social and cultural comment with short fiction, poetry and reviews. It contributes to the broad public sphere throughout Wales and its recently redesigned web presence is both lively and accessible. Planet is a true gem of a magazine. The breadth, variety and intelligent approach to the issues facing Wales and beyond ensures that I will read every copy many times, each time coming away with something new. It consistently publishes high quality, moving, thought-provoking pieces. Simply wonderful. I was proud to win the Planet Young Essay Writers award in 2013 with a piece that I felt passionately about but had no idea where it could be read. Planet was the only magazine with a competition encouraging this type of writing, what I thought to be a niche or too localised Welsh subject matter. The essay got me noticed and I have now been offered a publishing deal on the back of Planet's award, for which I will always be grateful. In Wales, as in many regions of European countries, our cultural and political life is not adequately supported and critiqued by nation-wide or international media. Our art, literature, drama, music are almost never reviewed in London-based magazines and our politics goes almost ignored in UK national newspapers. There is no critique at all of Welsh culture and political issues in Europe-wide publications. 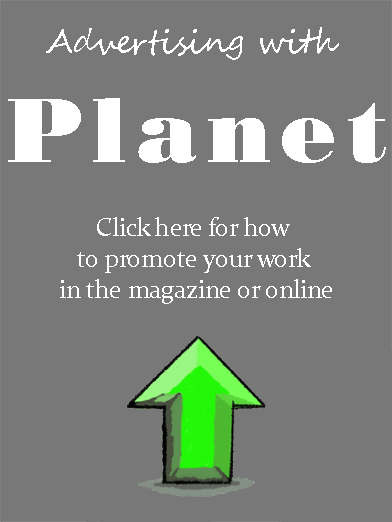 Planet is one of a very small number of serious periodicals that can be relied on to offer a mature critique of the political and cultural life of this devolved nation. Without Planet our culture would stifle in a critical vacuum; without Planet our already-worrying democratic deficit could only deepen. Planet is an essential element of our young Welsh polity. At a time when public discussion in our civic society could not be more important, there is no doubt that Wales would be a far poorer place without it. The international reach of Planet ensures access to Welsh social, cultural and political life for those of us in the diaspora. It holds a very special place in advancing and showcasing the life of Wales through critical debate, commentary and cleverly providing an intimate sense of the moment. Its signature must be its ability to engage a broad public, at home and away, with its accessible and readable style and superb visual material. While the English-language media in Wales continues to waste away at an alarming rate, and fails to put Wales in focus, current affairs magazines like Planet aren't just an optional extra – they're absolutely vital. Through Planet, I entered a country that acknowledged Vernon Watkins and Tryweryn, Dic Penderyn and Sartre, the experience of natives and newcomers. Wales, I learned, could be an infuriating, contradictory place. But never, never dull. Long after I bought that one-way ticket back I still have them, dog-eared and lopsided, on my shelf: the first few inches in feet of copies that now cover five decades and still speak. Still angry. Still contradictory. Still never dull. Please support Planet: Wales needs it to be truly itself. In a time of Brexit, when Wales’ political future is uncertain, Planet: The Welsh Internationalist could not be more needed. Placing Wales – its thinkers, artists, and social reformers – on a world stage, Planet makes connections between Wales and other countries, seeking to inspire, enrich, and develop projects at home. It is the only magazine in Wales with such an internationalist bent, and deserves the most support possible. A record of Welsh life, and advocate for the Welsh environment and communities, Planet also speaks to Cymraeg, for example in its illuminating keywords series, which explores the provenance and significance of specific Welsh words. Ultimately, it is a vehicle for the legacy of Wales’ greatest thinkers and reformers from Raymond Williams to Aneurin Bevan. It also speaks to the Welsh diaspora, for example in the United States where I am based, and draws attention to the influence and difference that Welsh people might make to the world.